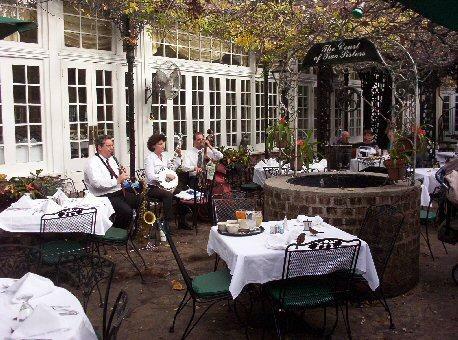 It is so easy in the Big Easy to find jazz and a jazz brunch on Sunday morning, even on the day of Super Bowl 47. I hate the use of Roman numerals for the Super Bowl. First, I realize it is a battle of two teams, but why the Roman numerals. I do not think the Romans numbered their lions or their Christians with Roman numerals when they placed them in the Coliseum all those years ago! No, my goal on Super Sunday, is to attend a good old fashioned gospel brunch. They say gospel brunches are a rather new fangled gadget here in Nawlins. They say it gives a non-religious audience a chance to enjoy a delicious brunch while listening to some uplifting, soulful music on the day (Sunday, of course) that it was meant to be heard and appreciated. We know by now, thanks to history books and the television spectacular, Roots, that gospel music formed its roots in the last century from old spirituals that gave hope and strength to slaves. The New Orleans version of gospel frowned upon any instrumentation aside from the soulful human voices from which it arose. This, in spite of the fact, that gospel music here adopted the mostly upbeat rhythms of Nawlins area jazz musicians. Additionally, choirs started on the small side, but grew over the years as it garnered more talented vocalists. History tells us it was the incomparable Mahalia Jackson, the “Queen of Gospel Music”, born and raised in Nawlins, who stands so tall over gospel music here and everywhere. She formed the Zion Harmonizers back in 1939, and they still perform today. Even during the annual Jazz Fest, the Gospel Tent overflows with high energy, and new fans. The Nawlins radio stations keep gospel artists close to their audiences. Now, the trick will be to get in. The Sunday gospel brunch runs from 10am to 11:30am. Another option is the Praline Connection. I may have to give that a try since House of Blues reputation for food is rather spotty.